Mark Twain once texted a cable from London to America and said, "the reports of my death have been highly exaggerated," after his obituary had been mistakenly published in an American newspaper. Which leads me to Trump's exaggerated claim that Obamacare is dead. Despite doing his best to dismantle Obamacare, Trump has failed to repeal or replace it. In one of his blustering mindless tweets he claimed everyone hated it. I suppose that's why there was a record 600,000 Americans who signed up for Obamacare in the first four days when enrollment opened. All the efforts to sabotage the health care system, like cutting back on the enrollment period from 60 to 45 days, are open defiance against the law of the land. But Trump hasn't seen a law he'll follow if he doesn't like it. 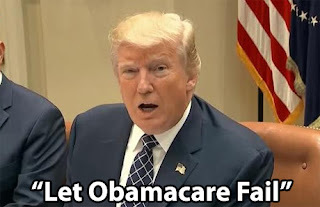 Not funding insurance subsidies was another trick Trump pulled. He's given Congress a timeline that they can't possibly meet, to come up with new legislation to address the deficit he's causing. Even if they did miraculously pass something, Trump won't sign it. His goal is to erase President Obama's legacy. By now we know he'll go to his little bag of dirty tricks and bullying to achieve it. Oh yeah! It doesn't matter how many millions - including his own supporters - of people who will lose health care if Trump succeeds in his goal. It is, after all, all about Trump. He's made that clear with the "I'm the only one who matters speech," recently. Here's the good news. People are signing up for Obamacare today in spite of Trump's best efforts.